The New York Times is doing a lot of great things with its website and RSS feeds. But somewhere along the way, they've introduced a bug in their code that generates the RSS feed for the home page. 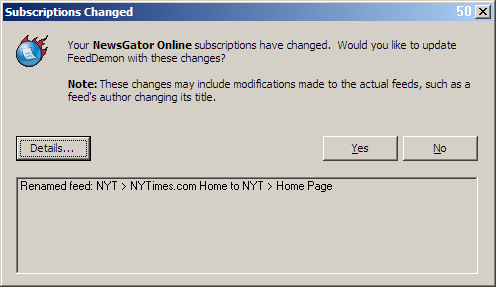 The bug is that the channel title switches back and forth between "NYT > NYTimes.com" and "NYT > Home Page". This alternates at least once an hour, all day long (as near as I can tell). This constant switching causes one of my feed readers (FeedDemon) to alert me of the change every time it occurs. Of course this latter point is not directly the Times's fault, but it is driving me insane. If you look closely at the raw RSS feeds, you will notice that they appear to be using two different tools to generate the same feed. So I guess the two tools are not configured exactly in sync with one another. Mike Arrington recently reignited some discussion about the definition of a blog. I have a related question: What is a podcast? Does each feed item need an enclosure? If not, what ratio of items with enclosures to total items makes a feed a podcast? Does the enclosure need to be in a dedicated feed element, or is it okay to just put a link to the enclosure somewhere in the feed description? For example, is this a podcast? The publisher, a big RSS technology company, seems to think so. There are other debatable points, too, such as whether Public Radio feeds are really podcasts, but I'm more interested in the technical points.